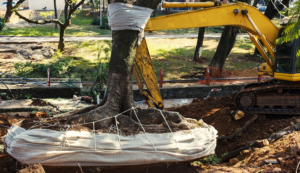 Tree Planting and Removal – Michael Serio Inc.
As we mentioned above tree removal is not our first choice in the preservation or care of your trees, however in some instances it is a necessary act in effort to ensure safety and aesthetics. 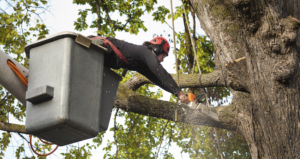 Our tree removal process is a professional execution with the aid of climbers and certified crane use. When finished with the removal, we will have our equipment ready to then grind your remaining stump and professionally complete the job. Our certified arborists will work with you to plant tree species that thrive in your landscape. We factor in your local climate, condition of your soil and general property & house size. Planting trees can be a laborious task. 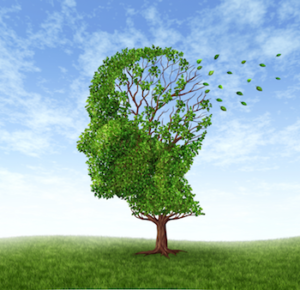 Michael Serio, Inc. has the experience and knowledge to ensure proper tree planting. Not only do they enhance your landscape, but their shade helps to conserve energy. 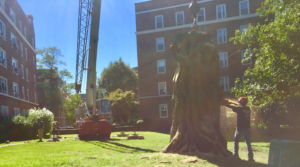 Our crane service ensures that no tree is too large for us to handle! Tree planting can completely transform your property into an eloquent landscape of art. As new life brings new beginnings, a carefully selected, placed, and maintained tree will magnify your properties beauty.